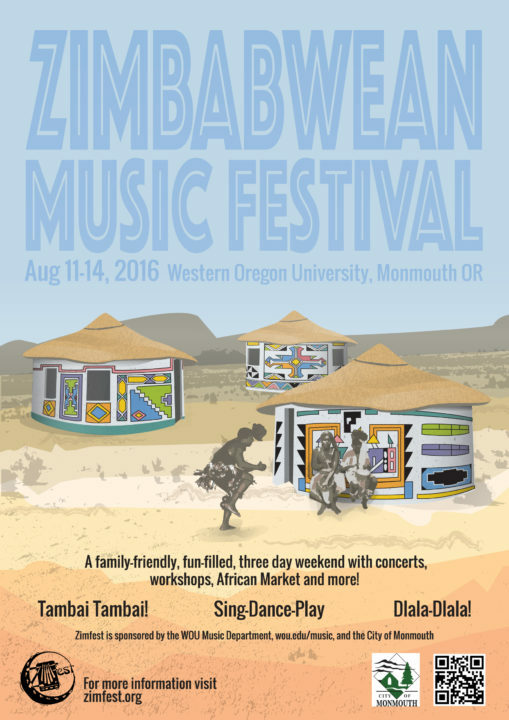 Zimfest 2016 was held August 11-14 at Western Oregon University in Monmouth. The WOU campus, just west of Salem, provided an attractive and comfortable site for our 25th Zimfest in North America. We were happy to return the festival to Oregon, in a location nearly equidistant from Portland and Eugene. The Monmouth area, in the heart of Oregon’s wine country, is also a great point of departure for day trips exploring the beautiful Willamette Valley or heading west to the Oregon coast. Zimbabweans joining us at Zimfest to teach and/or perform for the first time included: the Edmonton-based group Mbira Renaissance, led by Chakanaka Zinyemba; marimba specialist Simba Kamuriwo; dancer/mbira/hosho player Clayton Master; and cultural educators Victoria and Tapiwa Kapurura. Traveling from abroad to be with us are popular mbira virtuoso and teacher Musekiwa Chingodza (coming from Zimbabwe); Kwanongoma graduate and marimba expert Michael Sibanda (based in South Africa); and the multi-talented vocalist and dancer Lucky Moyo (traveling from England). Zimfest 2016 celebrated the theme “Sing-Dance-Play! Tambai Tambai! Dlala-Dlala!” In Zimbabwe you only need one word to say “Play (music)” or “Dance” or “Play (have fun)”: Tambai if you speak chiShona, or Dlala in isiNdebele. What could be more appropriate to describe the three-and-a-half days of Zimbabwean-inflected music, dance, song, culture and fun that is the Zimbabwean Music Festival? Come sing-dance-play with us August 11-14. Tambai! Dlala! Many thanks to Zimfest 2016 graphics artist Rachel Edson for her hard work and creative efforts. Her poster creation was inspired by the colorful geometric designs painted on houses by Ndebele women of southwestern Zimbabwe and South Africa.